Instructor User Guide ResourcesHow do I allow group members to upload content to a group Resources folder? Click Actions, then Edit Folder Permissions. To grant uploading permission to group members, to the right of the group folder, from the Actions drop-down menu, select Edit Folder Permissions. This displays the folder permissions dialog box. Note: You will need to make the folder a group folder in order to limit uploading permissions to a single group. 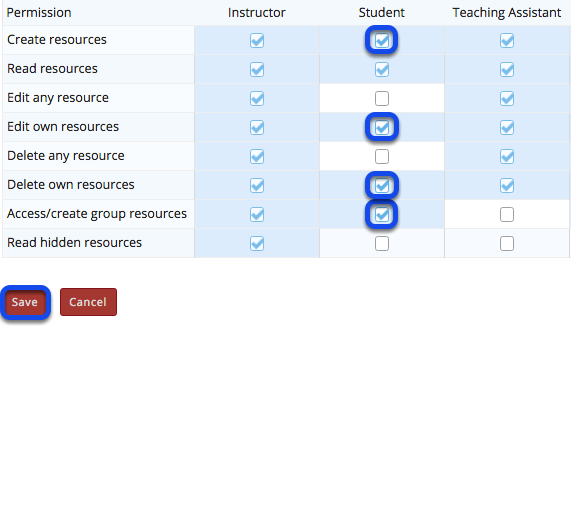 Modify student permissions and then Save. In the student column, select Create resources, Edit own resources and Delete own resources, and Access/create group resources, then click Save. Group members may now add and edit items. This allows the students that are members of the group to upload and edit content in the group folder. 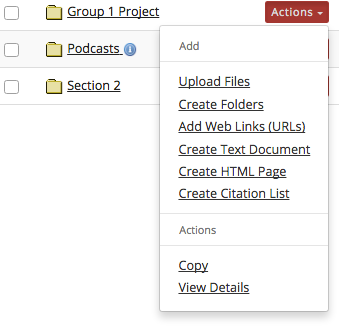 Students that are members of the group will have an "Add" section available in the folder's Actions dropdown menu. Prev: How do I create a group folder in Resources? 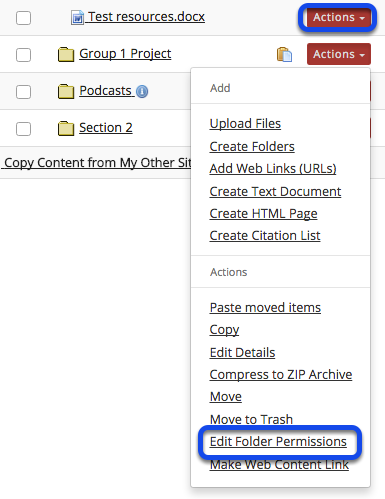 Next: How do I allow all students to upload content to a selected folder?